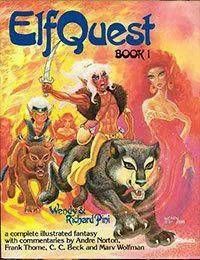 Reprints the original April 1978 to October 1984 WaRP Graphics ElfQuest series. A Hardcover edition with Slipcases, limited to 3,000 or 4,000, was also printed. These were signed and numbered with plain covers which have gold embossed designs and titles. A loose print of the Paperback editions cover or, in the case of Volume 1, other artwork was included inside the cover of each volume.